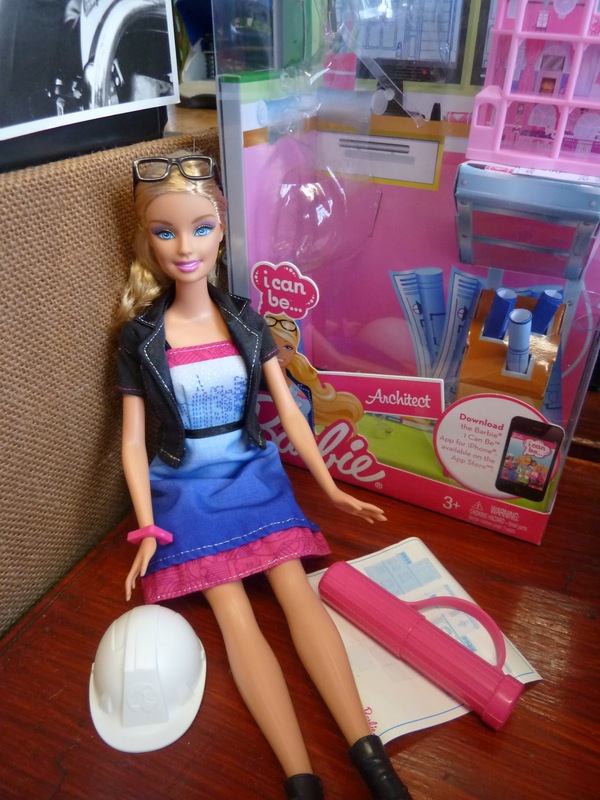 Love Letter from London: Meet Architectural Historian Barbie! A new colleague arrived for her first day in the office today and has been assigned the desk next to me. Having been there a couple of hours, she said to me, "I can't help but notice you have a Barbie on your desk". 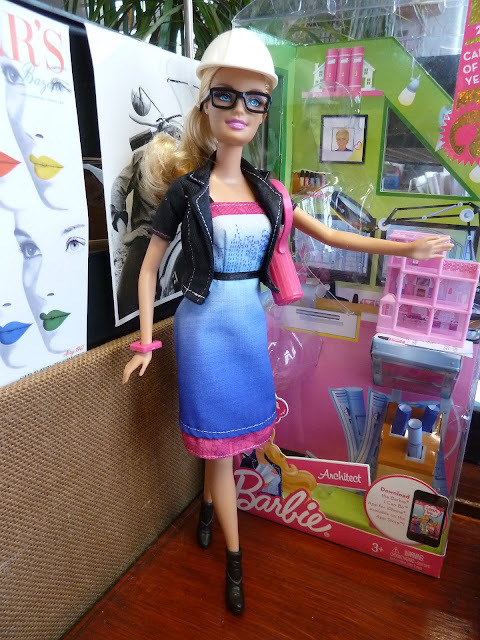 "Oh, that's Architect Barbie," I responded, and passed her over. This made me realise that I never got around to introducing her to my readers. So, without further ado, meet Architect Barbie! I read about her in the architectural press ages ago, when she was released. When I graduated from my Building Conservation course last year, my mum and I thought this would be a highly appropriate gift. I took her into work to show her off and my workmates insisted she stayed. So now she lives at my desk. I would ask for your suggestions on how to make her look like more of historian but I think it's a bit of a niche corner of geekery! Well, if she does gain some tweed or a crumbling ruin to reside in, I will keep you posted anyway. This is awesome! Are you one of those people who stops us listed building owners knocking down walls? ;) Fie! So, do you need me to help you out with a listed building consent application then? We were hoping to knock down a fireplace which is taking up masses of room between our kitchen and dining room. We asked the conservation man at Bromley if it would be possible and he made it clear that he would completely oppose it. Our House is Grade II, the listing is for the outside features only and most importantly OUR HOUSE ISN'T A MUSEUM! He said it'd take away from the 'character' of the building, but I don't see how a fireplace hole with a radiator sitting in it can have character! But as you say, you've got to think about the structure too, and when we thought about how we would have to make our planning application water-tight, we'd not just need to pay a structural engineer and builders, but I assume Bromley would insist on an architect as well. The planning man was open to discussions about us uncovering a different fireplace in the kitchen, but it would basically mean that we had absolutely nowhere to put an oven. So, we've had to give up on it and agree to knock our stairs wall through and get bannisters to open it up. Not ideal, because it means keeping the monstrous ugly fireplace, but it'll save us lots of money and stress. Oh, that's frustrating for you but sounds like a wise idea to abandon the plan, especially if you're on a limited budget. From what I know about almshouses (which is very little, I must confess) I can imagine that the interiors were originally very basic and utilitarian and the fireplace would have been almost a focus of the interior as probably the sole "decorative" feature. So that's probably what the conservation officer was getting at. Original fireplaces in general tend to be quite valued, even if they look pretty basic. And "character" is just some of the jargon we use as it's included in most policy, probably because it's a way of covering not only fabulous architectural masterpieces but also more humble elements of a building, which are still considered important for enabling an understanding of how the building was designed and functioned. But yes, from my experience, I'm not surprised you're encountering problems wanting to take out a fireplace. It's something people often want to do to free up more space (as you're experiencing) but they're also features which are obvious focal points in an historic building and therefore usually tiptoed around. And it may end up a good thing you kept it because the next person you sell it onto one day might be super excited to have a genuine Victorian fireplace! For the record though, it's a common misconception that only the exterior of a building is listed but the protection always applies to the whole building, inside and out. The reason list descriptions often only cover the outside features is because they're just supposed to enable you to identify the building. More recent list descriptions have more detail included but it still remains that, just because a feature isn't included in the write-up, it doesn't mean it's not listed. Just something you may want to bear in mind next time you're buying a place! That is a very interesting fact! Thank you!! Very close to perfect, she is! What fun?! Is that James Dean or Elvis on the bike behind her? Ha! Well spotted! It's Elvis. Someone sent me a postcard at work so it went up at my desk. This made me remember all the awesome times I had playing with and accessorising my Barbie when I was a ki - I was so serious about it, it was actually really cool. I bet I'd still get a kick out of it now! Love the fact that you have a profession specific Barbie - I'm going to have to look for mine now! Wow! That is SO interesting - all that you've written to Kate O. That little bit about fireplaces in almshouses is a fascinating observation. Difficult for Kate, of course, though. I've seen stoves tucked into large old fireplaces, looking fun and quirky. A friend and I sat, stretched out on the hearth, almost in, the fireplace in the Jerusalem Room at Westminster Abbey. I lay down on it, with my hands folded, like the King who was laid there when taken ill while travelling in London.